The blue (HTML), orange (JS), and orange-striped (render-blocking JS) bars show the start time and duration each network request. 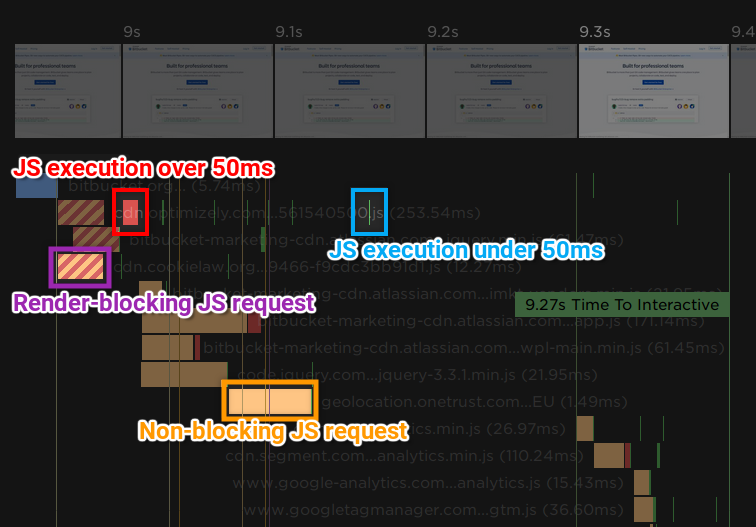 The red blocks to the right of each network request show JS execution that blocks the main thread for more than 50 ms. The green blocks to the right of each network request show JS execution that blocks the main thread for less than 50 ms. The vertical lines show page-level metrics like Start Render, Page Load, and Time To Interactive. Below the waterfall, script execution time is grouped by domain to help you identify problematic third-parties. Doesn't currently drill down to individual function calls. Has a relatively strong correlation with user experience. Only available in synthetic tests. Different milestones enable you to focus on the point in the page load that you want to optimise. Description: The User Timing API is a W3C standard that specifies an interface for developers to create timestamps that are part of the browser's performance timeline. SpeedCurve can extract all of the User Timing events in your pages, giving you the freedom to record any performance characteristics that you like. To see examples of what you can measure with the User Timing API, see our blog post. Available in both synthetic tests and RUM. Measures the things that are important to you and your users. Offers almost unlimited granularity - you can measure the time it takes to execute an entire script or just a single line. Requires adding performance.mark() and/or performance.measure() calls to the page. Identifying the right things to measure can be hard. SpeedCurve's LUX already collects this data. Not yet supported across all browsers. Is a good proxy for real user experience. Much smaller volume of available data, since it requires that users interact with the page. Not available in synthetic testing by default. Description: When SpeedCurve runs a synthetic test in Chrome, it records the timeline trace. This trace can be downloaded and loaded into Chrome DevTools to perform advanced performance analysis. Instructions on how to retrieve the timeline trace are available on this page. Automatically measures everything on the page. Can drill down to individual function calls. Requires an in-depth knowledge of the source code and a moderate understanding of the browser. Large amount of data can be overwhelming and difficult to interpret. Extremely difficult to extract meaningful data in an automated/programmatic fashion.